Report injured or dead manatees to the Florida Fish and Wildlife Conservation Commission at 1-888-404-FWCC (3922), #FWC or *FWC on your cell phone or or send a text message to Tip@MyFWC.com. You can also use VHF Channel 16 on your marine radio. Get a boater’s guide for the county or counties you will be visiting so you can become familiar with the location of manatee speed zones before your trip. Wear polarized sunglasses while boating to eliminate the glare of the sun and see below the water’s surface. Stay in deep water channels when boating. 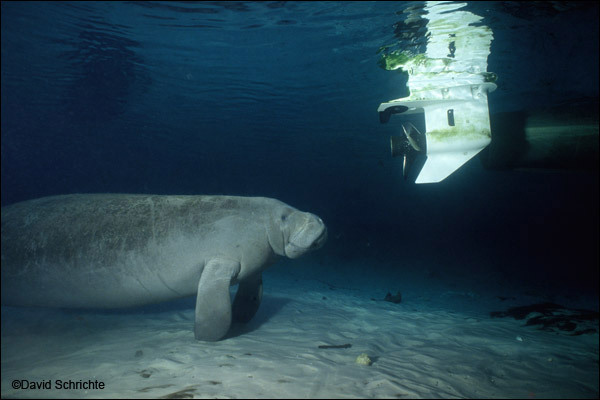 Avoid boating over seagrass beds and shallow areas where manatees might be feeding. However, be aware that manatees also use deep water channels when traveling. Look for a snout, back, tail, or flipper breaking the surface of the water. A swirl or flat spot on the water is also created by the motion of the manatee’s tail when it dives or swims. If you see a manatee while operating a boat or personal watercraft, remain a safe distance away — 50 feet is the suggested minimum. If you want to observe the manatee, cut your motor. If you like to jet-ski, water-ski, or participate in high-speed watersports, choose areas that manatees do not or cannot frequent, such as land-locked lakes or waters well offshore. Obey posted speed zone signs and keep away from posted manatee sanctuaries. A living manatee bears scars from a boat hit. Recycle your litter or throw it in a proper trash container. Debris in waterways, such as discarded plastic bags or six-pack holders, is dangerous to manatees and other forms of wildlife. Discard monofilament line or fishing hooks properly (better yet, recycle it!). 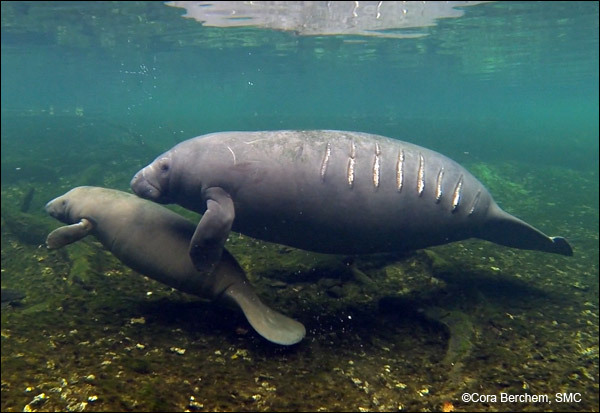 Not only are they dangerous for manatees, other aquatic animals and swimmers, but discarding monofilament line into or onto the waters of the state of Florida is against the law. Resist the urge to feed manatees or give them water. Not everyone loves manatees and feeding them or giving them water could encourage them to swim to people who might harm them. Their natural feeding patterns may also be altered by encouraging them to “hang around” waiting for food or water. When hand-fed lettuce or water from a hose is no longer available, manatees may not know where to find or identify natural, reliable sources of food. “Look, but don’t touch” is the best policy when swimming or diving. By quietly observing manatees from a distance, you will get a rare opportunity to see the natural behavior of this unique animal. Any other actions might be considered harassment, which is against the law. Click the following link or the image above to get our free brochure. You can also request the brochure by regular mail by sending an email to education@savethemanatee.org or call our toll-free number at 1-800-432-JOIN (5646).